Summer in Thailand (June, July, and August) ushers in monsoon season. The Southwest Monsoon builds with rainy days increasing steadily until October. But there is some good news: Rain cleans the hazy air of dust and smoke. Tourist numbers lower slightly, perhaps increasing chances of scoring discounts. Although the summer rainy season is also the “low season” for tourism, Thailand is such a popular destination that most of the top places to visit will still feel as busy as ever! In fact, the number of backpackers increases a bit as many students take a break from school and see the world. Australian travelers escaping winter in the Southern Hemisphere often begin trips in Bali, but some grab cheap flights up to enjoy Thailand's islands. Each year, fires (some are natural, but many are set illegally) get out of control in Northern Thailand causing terrible smoke and haze to choke Chiang Mai, Chiang Rai, and Pai. Particulate levels consistently reach dangerous thresholds, prompting locals to wear masks. March and April are two of the worst months for pollution from fires. Air quality should have cleared up by June, but if the monsoon is delayed, particulate matter could still be a health risk. Travelers with respiratory conditions should check the situation before booking a trip to Chiang Mai or Pai. As storms begin battering the Andaman coast, many businesses on the popular island of Koh Lanta close up for the season. Western business owners travel or return home. Although the island never fully "closes," you'll have less choices for eating and drinking outside of your resort. Many of the best beaches get messy as storms wash in rubbish. Along with May, June is considered the start of the monsoon season in Thailand—the weather will be hot, humid, and increasingly wet. That said, there will still be plenty of hours of sunshine for enjoying a vacation in Thailand. Interestingly, average rainfall in June is slightly less than in May. The dip in numbers almost comes across as the Southwest Monsoon taking a breath before steadily building to a stormy crescendo in September and October. The number of rainy days increases for July but not enough to cool temperatures much. By now, air quality should be better, but days will still be very hot. Showers continue to grow in strength through August. Islands in the Samui Archipelago receive slightly less rain than those on the west coast of Thailand (Phuket, Koh Lanta, and Koh Phi Phi). Have a means to quickly waterproof your luggage, backpack/purse, phone, and passport for when monsoon showers pop up. Waterproof bags, such as the ones divers use, can be purchased locally. Although you'll be traveling during rainy season, no need to pack a poncho or umbrella—both are available locally in abundance. Bringing quality rain gear is an option, however, you'll want items that aren't insulated! You’ll obviously want breathable, loose-fitting clothing for those three-shower days while walking around the city. If the urban heat in Bangkok becomes unbearable, there are some nearby escapes for getting out of the city. A couple of important royal birthdays occur during summer in Thailand, but the events aren't as large as festivals such as Songkran (April) and Loi Krathong (November). King Maha Vajiralongkorn's Birthday (July 28): The most notable event for travelers is King Maha Vajiralongkorn's Birthday celebrated on July 28. This holiday is not to be confused with King Bhumibol's (the former King of Thailand) birthday on December 5. Queen Sirikit's Birthday (August 12): The birthday of the Queen Mother also serves as Mother’s Day in Thailand. Public stages are erected with cultural shows; a candlelight ceremony is held in the evening, sometimes followed by fireworks in honor of Queen Sirikit (born in 1932). Buddhist Lent (dates vary): A few Buddhist public holidays such as Buddhist Lent take place in June and July. Travelers hardly notice beyond the ban on alcohol sales that day. You may see a few less monks in public, and following good temple etiquette is especially important during this time. Rain is slightly less intense in the summer for islands such as Koh Samui, Koh Tao, and Koh Phangan. The Chao Phraya River in Bangkok is subject to flooding when rain gets too heavy. Flooding isn't ordinarily a problem in summer, but allow extra time for flights just in case. You may be able to negotiate low-season rates at hotels and guesthouses, particularly later in the summer as tourists begin to thin out. As rain causes stagnant water to build in flower pots and other containers, the mosquito population increases. Take extra precautions for avoiding bites, particularly at dusk. 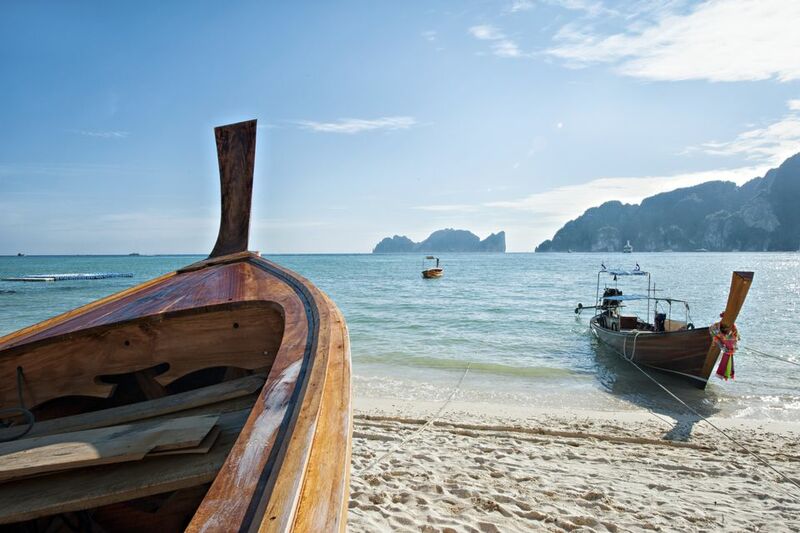 The climate differs for the Thai islands in summer, depending upon which side of Thailand. Koh Chang in the Gulf of Thailand receives the most rainfall in June, July, and August, but rain isn’t too bad farther south in Koh Samui and surrounding islands (Koh Phangan, and Koh Tao) until around October. The wettest months on Koh Samui are often October, November, and December. Meanwhile, on the other side of Thailand, the monsoon hits Phuket and the islands in the Andaman Sea (Koh Phi Phi and Koh Lanta) around May. Rainfall drops off sharply by December. Some islands, such as Koh Lanta on the west coast of Thailand, mostly shut down after June as storms move through. A few businesses will remain open, but there won’t be as many choices for eating and sleeping. Summer is rainy and therefore the “low season” in Thailand, but popular party islands remain busy. University students from around the world take advantage of summer breaks to go backpacking and party hard on islands such as Koh Tao, Koh Phi Phi, and at Haad Rin on Koh Phangan. Traveling families also seize the opportunity to travel while children are out of school. Thailand isn’t the only place to party for backpackers in summer. The weather in Malaysia’s Perhentian Islands and Indonesia’s Gili Islands is actually better in the summer. Perpetually busy Bali gets even more crowded in summer as travelers go to take advantage of the dry season in the southern part of Southeast Asia. Each summer, the Tourism Authority of Thailand hosts the Amazing Thailand Grand Sale from mid-June to mid-August in an effort to promote tourism during the low-season months. Shops that are part of the summer sale display a special logo and offer discounts purportedly up to 80 percent off regular prices.